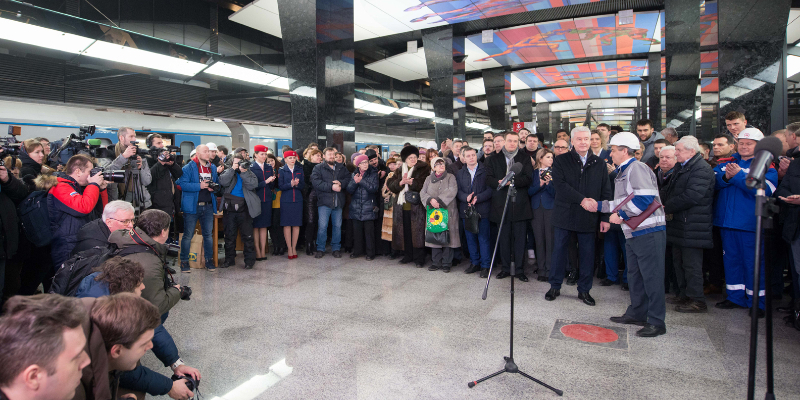 Moscow mayor Sergey Sobyanin has opened the first section of the Moscow metro’s new Large Circle Line. The 10.5km Delovoi Tsentr–Petrovsky Park section includes five new stations: Petrovsky Park, CSKA, Khoroshovskaya, Shelepikha and Delovoi Tsentr. Sergei thanked construction workers for a “heroic feat” and completing the “difficult and complex work” to cross several metro and railway lines in difficult geological conditions. He added: “This is an historical day for Moscow, Muscovites and the Moscow metro. “This is one of the largest metro lines in the world. The entire line should be completed in the next four to five years. The Large Circle Line will be 69km-long, have 31 stations, two maintenance facilities and It is set to east congestion on Line 7, Line 2 and the Circle line.